Qlicktrack bring Ad network, Advertiser and Affiliates together enabling them to use innovative features as Geo, OS, Browser & Device targeting, Fraud management, Quickest real-time data with ease of customization. QlickTrack empowers marketers to manage offers, clicks and conversions tracking, payout, revenue, billing and much more. Deliver measurable results and drive higher return on investment. Real time campaign provides you the data you can trust. We are cloud-based and globally distributed. Facilitate affiliate/advertiser SignUp by using our hosted cloud network and easy-to-use SignUp form. Authentication token used, if it is not matched with the particular token then the conversion is rejected. Real-time data helps you to take instant decisions and evaluate performance of every offers. Customize your offers into categories. It helps managers to manage and view performance by categories. Infrastructure You Can Rely On. We have world class, highly available infrastructure. Faster response time, even on mobile networks. So you do not even miss a single click. We are on cloud, this enables us to auto scale infratstructure as and when required, we will take care of all infra, while you foucs on you business. Our servers are highly optimized for application performance, hence we are able to provide low cost solutions to all our clients. Cloud base infrastructure enables us to provide a highly available application with minimal efforts and cost, we make sure your users are able to connect all the time. With cutting edge technology and innovation, we are able to provide an infreatructure and application which helps our client to get ultra fast response. We are using latest version of softwares and technlogies to secure our clients data and information. QlickTrack engineers are at their best to use optimal resources in order to save cost on infrastructure, and we pass on this saving to our clients. An entrepreneur and technologist by passion, having 16 years of vast experience on databases, server and network infrastructure, application development, web services, service oriented infrastructure, etc. Known for innovation and leveraging the experience and skills to create long term technology solutions for businesses, a true problem solver, worked over 1000+ open source applications. A believer of power of Linux and Open source technologies to build and scale technology stack and optimize the overall expenses on engineering and technology. 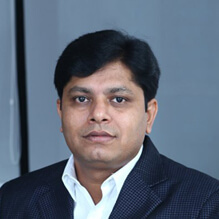 Mr. Aniruddh started QlickTrack with a vision to give a valuable tool to affiliates, advertisers and ad network that could help them in geo-targeting, fraud management etc. Start Today With A 45 Days Trail. Need Support Finding The Package That Works For You? 2nd Floor, H-138, Sector - 63, Noida, U.P. Address : 2nd Floor, H-138, Sector - 63, Noida, U.P.